Jack has done a lot of hiding thus far during the season—hiding from the Daughters Of Aku, hiding from robot assassins, hiding from the brainwashed feral children, hiding from himself. But, as “XCVI” makes clear, he’s eventually going to have to emerge from the shadows. Even as Jack is, usually, a lone warrior fighting off Aku’s minions, this episode goes out of its way to remind us that he has allies, allies who would be more than willing to help him in a final showdown against Aku. First and foremost is the Scotsman, Jack’s best-known pal from the original run of the show. “XCVI” opens with a scene of several armies, including Romans and a legion of the Scotsman’s red-haired daughters. They’re cut down effortlessly by Aku, who apparently has retreated into a constantly shifting tower (reminiscent of the tower from “Jack And The Three Blind Archers”). Even though this episode teases at an impending Jack-Scotsman reunion, it still focuses primarily on the samurai’s most important current ally: Ashi. The former assassin is having her own version of the visions Jack has been seeing all season—except in this case, it’s the High Priestess spurring her daughter on to murder. Ashi rejects this compulsion, instead choosing to ride a sea dragon with Jack, bother the samurai about Aku’s history of evil, and, eventually, fight her way through a factory in order to save a bunch of children. By the end of the episode, she’s all in on Jack’s quest—and possibly the primary protagonist of the next episode. That’s because Ashi and Jack share something important: an appreciation of the natural world. A shot of Ashi nervously looking down as the sea dragon spirals through the air manages to both perfectly replicate my first experience on a roller coaster and give a sense of the gravity of what she’s going through. When Jack explains the origin of the moon and sun—or, at least, his mother’s version of the story—it’s positively cartoonish and bright, probably the most upbeat sequence of the season so far. It doesn’t matter whether or not there really “was” some metaphysical entity that created the celestial bodies. The point is that they’re part of the natural world, not Aku’s. And “XCVI” gives the impression that Jack might need Ashi more than he lets on. Note that when she’s present, his visions stop. He preaches patience in her training and in their action, but Jack, of course, can afford to be patient—he isn’t going anywhere. The rest of the world isn’t so blessed (or cursed, depending on who you ask). And Jack has long since resigned himself to futility. 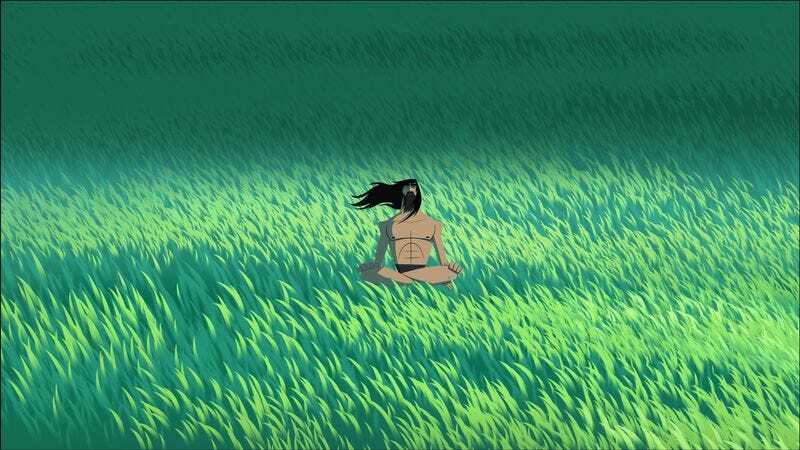 “There is no hope,” he tells Ashi, but the fire of her youth and fresh perspective reaffirm the urgency of his mission in a way even his soul-searching can’t. The pair return to Aku’s megacity (one of the show’s best settings), where Jack dresses like some combination of noir private investigator and cartoon pimp and eventually discovered a group of kidnapped, brainwashed feral children who try to take Jack down. (The efficiency of this entire sequence is just marvelous, trusting the viewer to know where everything is going.) A gross man in a red robot suit (credited as Dominator and voiced by Aaron LaPlante), presiding over the whole operation, captures her and traps in a torture apparatus to be electrocuted—which she escapes, in an act of inhuman willpower that truly marks her as a successor to Jack. But she’s too late. The silhouette of the antlered samurai returns again, at a moment when Jack thinks he’s responsible for the deaths of all of the children (they wake up, conveniently, moments later). “It is time,” Jack says, and walks off with the apparition—seemingly a manifestation of death, or of total hopelessness. What metaphysical realm is Ashi going to have to drag Jack back from? We’ll have to find out next week. How, exactly did the Scotsman come back from the dead so quickly? “Celtic magic.” Thank God for John DiMaggio. I’ll say this for Aku: He welcomes criminal aliens of all stripes. More importantly, who are the aliens running the planets all of these criminals come from? Can Jack get any help from them, or nah? Sorry for the delay on this one, everyone—should be up a little earlier next Sunday morning.